Due to a weakness of the posterior part of the disc, damages of the cartilage ring (anulus fibrosus) can occur. That is, the posterior protective ring tears or protrudes. Through the tear, the softly inner part of the disc protrudes and, thereby, compresses and irritates a nerve (see images A and B). Physicians then talk about slipped disc, herniated disc, disc herniation or disc prolapse. Most herniated discs are to be found in lumbar spine or cervical spine. Which kind of complaints occur depends on height and direction of slipped disc. It is differed between those that are in the middle and cause back pain, and those that are more lateral and cause leg pain. Not only heavy lifting and accidents but wrong body twisting and certain movements can cause a slipped disc if there is a genetic disposition. Risk factors comprise hereditary factors (‘weakness of the connective tissue’), overweight and a lack of movement, permanent sitting, some occupational strains (trucker) and smoking. Furthermore, a bad muscle condition can enlarge the risk of a slipped disc. To differentiate a slipped disc from other spinal diseases causing similar complaints, patients first get a neurological-orthopedic examination including a comprehensive talk about the history and treatment of illness. Often imaging examinations like MRI follow. Magnet resonance imaging enables us to examine and visualize a slipped disc and other spinal diseases very thoroughly. At Beta Klinik we use an open MRI system which allows us to comfortly examine patients suffering from claustrophobia or patients up to 250 kg (500 lbs). The upper MR image shows a large herniated disc in the lowest lumbar segment with compression of the nerve roots. 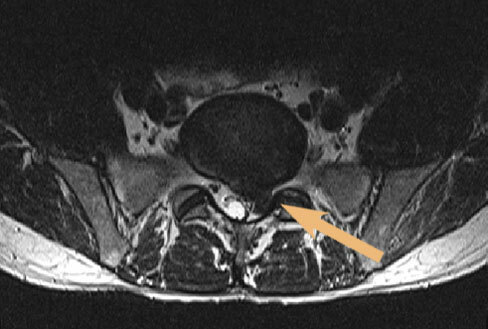 At the right MR image, the same herniated disc is depicted transversally. Some slipped discs can be successfuly treated by conservative means: use of painkilling and anti-inflammatory drugs and avoidance of heavy strains, especially bending over, lifting, pulling and quick turns. In such cases, the healing process of a slipped disc takes significantly longer. After acute pain treatment, a physiotherapy programme with specific exercises for the strengthening of the abdominal and back muscles should follow. A revision of slipped disc therapy and surgery has to be discussed if conservative therapy does not improve the condition substantially; that means if pain is unbearable or neurological deficits occur. It is outdated that surgery in case of slipped disc is only indicated if neurological deficits exist or paraplegia seems to be imminent. In the face of minimally invasive surgery techniques, it is no longer recommendable to comply with the so-called stepwise phase model, which dictates 6 weeks of conservative measures. 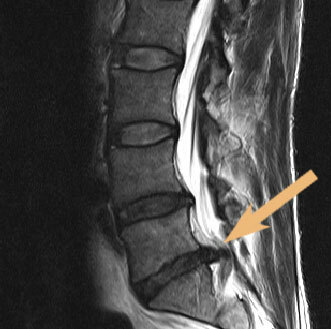 Apart from classical indications (acute paralysis, imminent paraplegia), surgical removal of a slipped disc is even indicated after a few days due to heavy pain, decrease of sensation, imaging-proven symptomatic slipped discs, and with regard to the individual occupational and private life situation. Please click here to get comprehensive information about when surgery is medically indicated. The therapy of a slipped disc with microtherapy is comparable with microtherapy of vertebral joints. Under CT navigation, a thin needle is inserted into the osseous nerve root canal. Through this needle we inject swelling reducing and painkilling drugs around the nerve root. Like microtherapy of vertebral joints, microtherapy of a slipped disc has to be repeated two or three times in weekly intervals. The drugs can be applied epidurally in severe cases. This means that they are injected into the spinal canal right before the dural sac. Endoscopic surgery in case of a slipped disc is a very gentle and efficient method that has revolutionized slipped disc therapy. This kind of surgery is easy on muscles and tendons. Instead of making a skin cut, the endoscope is inserted through natural openings of the spine. Such a procedure is possible because the endoscope has an diameter of only 7 mm (0.28 inches). Through this small opening, we work with small instruments to remove the disc herniation. You can find detailed information concerning endoscopic surgery in case of slipped disc by clicking here. In some cases, it can be useful to perform an endoscopic abrasion. This minimally invasive endoscopic method does not only allow the gentle removal of slipped discs/disc protrusions, but also induces a regeneration of these discs. To improve regeneration and revitalization, the calcified ground and end plate of the adjoining vertebral bodies are perforated by minute instruments inducing the migration of stem cells into the disc space. It also enhances the water balance of the disc. Here you find more information on endocopic abrasion. The safety and effectiveness of the microurgical removal of a disc herniation is similar to those of endoscopic surgery. But instead of using and endoscope, a special operation microscope is employed and a small skin cut is necessary. By means of the microscope, our phyiscians are able to operate very precisely. Here you can read more about microsurgery. In some cases, a disc is replaced by an artificial disc during disc prosthesis surgery / artificial disc replacement (ADR) surgery. The artificial disc preserves the spinal flexibility despite the removal of the natural disc. Click here to learn more about disc prosthesis / artificial disc replacement (ADR) surgery. The causes of a slipped disc in cervical spine are similar to those in lumbar spine. Also comparable are conservative means and the microtherapy, but surgery is different. Some slipped discs can be successfuly treated by conservative means: use of painkilling and anti-inflammatory drugs and avoidance of heavy strains, especially bending over, lifting, pulling and quick turns. In such cases, the healing process of a slipped disc takes significantly longer. After acute pain treatment, a physiotherapy programme with specific exercises for the strengthening of the abdominal and back muscles should follow. A revision of slipped disc therapy and surgery has to be discussed if conservative therapy does not improve the condition substantially; that means if pain is unbearable or neurological deficits occur. It is outdated that surgery in case of slipped disc is only indicated if neurological deficits exist or paraplegia seems to be imminent. In the face of minimally invasive surgery techniques, it is no longer recommendable to comply with the so-called stepwise phase model, which dictates 6 weeks of conservative measures. The therapy of a slipped disc with microtherapy is comparable with microtherapy of vertebral joints. Under CT navigation, a thin needle is inserted into the osseous vertebral canal. Through this needle we inject swelling reducing and painkilling drugs around the nerve root. Like microtherapy of vertebral joints, microtherapy of a slipped disc has to be repeated two or three times in weekly intervals. The drugs can be applied epidurally in severe cases. This means that they are injected into the spinal canal right before the dural sac. The safety and effectiveness of the microsurgical removal of a disc herniation is similar to those of endoscopic surgery. But instead of using and endoscope, a special operation microscope is employed and a small skin cut is necessary. By means of the microscope, our phyiscians are able to operate very precisely. The damaged disc is removed from the anterior side of the neck. If there are osseous stenoses of the spinal or the nerve root canal, they can be eliminated this way. The substitute for a disc is a stable implant, the so-called cage. Read mor about microsurgery by clicking here. In some cases of a slipped disc, a disc is replaced by a synthetic disc during disc prosthesis surgery / ADR - Artificial disc replacement surgery. The artificial disc preserves the spinal flexibility despite the removal of the natural disc. Click here to learn more about disc prosthesis / ADR surgery. This text is primarily written for medical colleagues but can also be interesting for laypersons; in case of unknown words, please visit our glossary, or simply contact us. You can also download this text as PDF. Please click here with right mouse button, save as, and choose your destination folder. The indication for disc surgery in case of lumbar and cervical disc herniation is – like every surgical procedure – crucial for its success. The success of a surgical treatment for lumbar disc herniations amounts about 90% according to specialist literature. Therefore, it is necessary to clearly differentiate a disc herniation or slipped disc (so-called soft prolapse) from osseous stenosis (hard disc, spinal stenosis). In terms of a fixed, osseous stenosis with claudicatio spinalis, a conservative treatment is not suitable to permanent cure. To the contrary, its conservative treatment can be a faulty treatment (e.g., cervical spinal stenosis with myelopathy, see below). A symptomatic spinal stenosis has to be similarly assessed as a so-called mass prolapse, and entails a compression of the cauda accompanied by the danger of a permanent paraplegia. Thus, the primary indication for surgery is given, and the more this holds concerning cervial spinal stenosis with perceptible myelopathy. To indicate a conservative treatment and refuse surgery indication is almost a malpractice because paraplegia can even occur in case of trivial injuries. The discussion on conservative vs. surgical treatment is only valid with regard to the uncomplicated, ‘soft’ disc herniation, i.e., the prolapse without neurological symptoms with slight pain and moderate changes visible in imaging examinations. Indication criteria for patients suffering from the abovementioned uncomplicated, ‘soft’ disc herniation are not distinctly and clearly described (Luehmann et al.). For evidence-based guidelines, the basic condition for all invasive measures with respect to disc herniation treatment is a congruence among the results of medical history, clinical and imaging examinations (e.g., CT, MRI). Furthermore, patient´s expectations on cause and development of their illness as well as personal living conditions are prognostic factors that have to be considered if weighing up the proper treatment (Clinical guideline on low back pain (AAOS) and guideline ‘Kreuzschmerzen’, Evidenzbasierte Leitlinie der Deutschen Gesellschaft fuer Allgemeinmedizin und Familienmedizin, 2003). The guideline of Deutsche Gesellschaft fuer Neurochirurgie (German Association for Neurosurgery, last version) also classifies fresh, extreme paralyzation and imminent death or nerve roots as indications for emergency surgery. Additionally, when facing paralyzations, increasing sensation disturbances, mass prolapses (e.g., with osseous stenosis) and big sequesters (e.g., with osseous stenosis), surgery is indcated without previous conservative treatment according to the guideline. Extreme radicular pain, which cannot be affected by analgesics in a short period of time, and which shows adequate results in imaging examinations (e.g., MRI), justifies early surgery. In case of a slight development of disc herniation, a conservative therapy is an alternative if it results in distinct alleviation of pain within 6-8 weeks and an increase of load bearing capacity. Otherwise, a revision of therapy or the surgical option should be taken into consideration (Rothoerl et al. 2002, Postacchini 1996). An uncritical continuation of conservative treatments can lead to a chronification of pain syndromes. A clear therapy recommendation (surgery yes or no) is missing in all guidelines for patients with symptomatically and clinically proven disc herniation (medical history, clinical examination, and, if necessary, imaging examinations) who do not suffer from cauda equina syndrome or motory dysfunctions. Besides this fact, the guideline is not valid anymore since its validity was restricted to 2006. A new one is still missing. Apart from this, it has to be mentioned that guidelines do only fulfil recommendation purposes and are not binding. Decision making, thus, is at every doctor´s discretion, considering all clinical and personal aspects of his or her patient. Within the guideline of Deutsche Gesellschaft fuer Orthopaedie und Orthopaedische Chirurgie (German Association of Orthopedics and Orthopedic Surgery), there is no current guideline on the topic disc herniation. Several, even foreign (USA), evidence-based orthopedic guidelines demand an initial waiting period of 4-8 weeks with conservative therapy before primary discectomy if results of medical history, clinical and imaging examinations and considered patient´s expectations match without any doubt. As claimed by Kraemer et al., the indication for lumbar discectomy is given if conservative treatment does not show any improvement of symptoms (severe pain) after at least 6 weeks of therapy, and MRI or CT proof the existence of a disk protrusion or prolapse. They refer to contraindications like back pain without radicular symptoms, uncertainties with regard to diagnosis, missing patient´s willingness and spine hypochondria. The study is a published opinion of the researchers and not the recommendation of, for instance, a specialist association. Other authors utter on the contrary that patient´s degree of suffering is a crucial criterion for an early indication of invasive measures for patients suffering from discogenic back pain even without neurological deficits (Mayer, HM: Discogenic low back pain and degenerative lumbar spinal stenosis – how appropriate is surgical treatment? In: Der Schmerz 15 (2001) Nr. 6, S. 484-491). Based on the aforementioned information, there is no clear definition of indication and no binding evidence-based guideline. In every single case, it is the decision of the attending doctor considering all relevant factors and medical reports. In Germany the Arbeitsgemeinschaft der Wissenschaftlichen Medizinischen Fachgesellschaften (AWMF – Association of Scientific Medical Societies in Germany) publishes rules for the indication for non-emergency or urgent cases comprising ischialgia/sciatica and degenerative lumbar nerve root compression (compare Luehmann et al.). Both guidelines consider history of illness and results of clinical and imaging examinations for their decision-making. The decision is at attending doctor´s own discretion. As a result, one can conclude that there is no homogeneous schematic procedure which dictates conservative treatment but rather a procedure focussing on the individual case and patient´s individual situation. It has to be taken into account that the cited German guidelines are so-called stage 1 guidelines. The contents are worked out from a specialist group within the specialist associations. A systematic and transparent explanation of their recommendations with corresponding evidence has not been made. The concept of evidence in medicine corresponds to the anglophone definition of evidence as the best existing scientific knowledge. In terms of competing diagnosis and therapy options, it does not automatically mean that an option with a high degree of recommendation is superior to any other option because the evidence focuses on the special case, and often studies analyzing alternative methods and options are missing. The inefficacy or inferiority to certain options is only valid if it is scientifically proven. Here, guidelines are not binding and the decision is still at attending doctor´s own discretion, especially since guidelines belong to group D and not A or B according to the internationally renowned recommendation of SIGN. Furthermore, it has to be born in mind that the last update of the guideline of the Deutsche Gesellschaft fuer Neurochirurgie (German Association for Neurosurgery) took place in 2004 (substantially unaltered since 1999 and only valid until 2006), and that especially microsurgical and endoscopic surgery techniques have significantly improvedso that surgery does not only have fewer complications but also a higher degree of success. As a result of the abovementioned argumentation, it is not bearable from a medical perspective in the face of therapy options with quick and excellent cure to conduct 6 weeks of conservative treatment for a patient who suffers severely from pain, or for a patient whose social, occupational (e.g., freelance entrepreneur, craftsman or pro sports athlete) and existential restricions demand acting fast. This holds, especially since there is the danger of worsening of patient´s condition, and since a conservative treatment with drugs does entail serious side effects, risks and the danger of chronification. In every case, we try to interdisciplinary (neurosurgery, neurology, orthopedics and pain therapy) evaluate the best possible therapy for the individual patient. In case of lumbar disc herniation, this could be conservative treatment but also, depending on the individual case, an early surgical proceeding without long-lasting conservative treatment. Cervical disc herniation and extreme lumbar spinal stenosis and cervical spinal stenosis have to be treated completely differently as mentioned at the beginning of this text. In our opinion, it is not correct to generally and obstinately demand conservative therapy without any clear scientific basis and partially despite scientific recommendations, and not considering the difference between diverse illnesses with disparate etiology and prognosis.